Château Mondésir Gazin in Plassac, next to Blaye, Bordeaux Right Bank, belongs to the so-called “petits châteaux”. There are many of these châteaux that produce excellent wines for a fraction of the price of the classified wines. Château Mondésir Gazin is one of them. We started in the vineyard, where Marc Pasquet talked with us about the challanges he was facing as an organic winemaker. 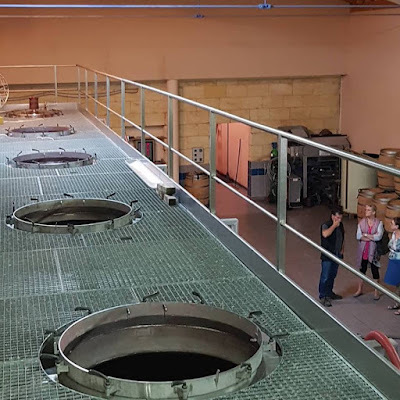 From there, we moved on the winemaking facilities and the barrel cellar, before sitting donw in the modern tasting room. Here, Marc introducd us to his outstanding portfolio by pouring 6 wines. Marc Pasquet: Situated in Plassac, this estate is called after two hillside vineyard parcels – “Gazin”, facing directly south, and “Mondésir”, overlooking the Gironde estuary. The natural beauty of this landscape and the extremely high quality of these terroirs, incited us to acquire this property in 1990. Over the past 25 years, we have been unrelentingly committed to the elaboration of wines fully expressing the characteristics of this microclimate. 35 acres of vineyards belong to the Château and consist of clayey-limestone slopes. The typical grape varieties used are Merlot, Cabernet-Sauvignon and Malbec. They use no chemical weed killers, no pesticides or anti-mold treatment. The grapes are always harvested entirely by hand. The extraction of the color and tannins is always smooth and slow. Planting 7 acres with 7 400 stocks per hectare was a small revolution in the region. This guaranties an excellent ratio between quality and price. We tasted 6 wines. The wines are available in the Washington DC area through Elite Wines. Elite Wines: 65% Merlot, 35% Malbec. 35 years old vines on average. This wine shows a dark color, intense & profound nose of black fruits, spices, cedar, lead pencil, and spicy oak, in which it ages for 18 months, in 33% new barrels. More of the same flavors on the palate, in a full-bodied style, extremely round, juicy, & supple, with a tightly knit yet very ripe structure and concentration. Superb finish with hints of licorice. 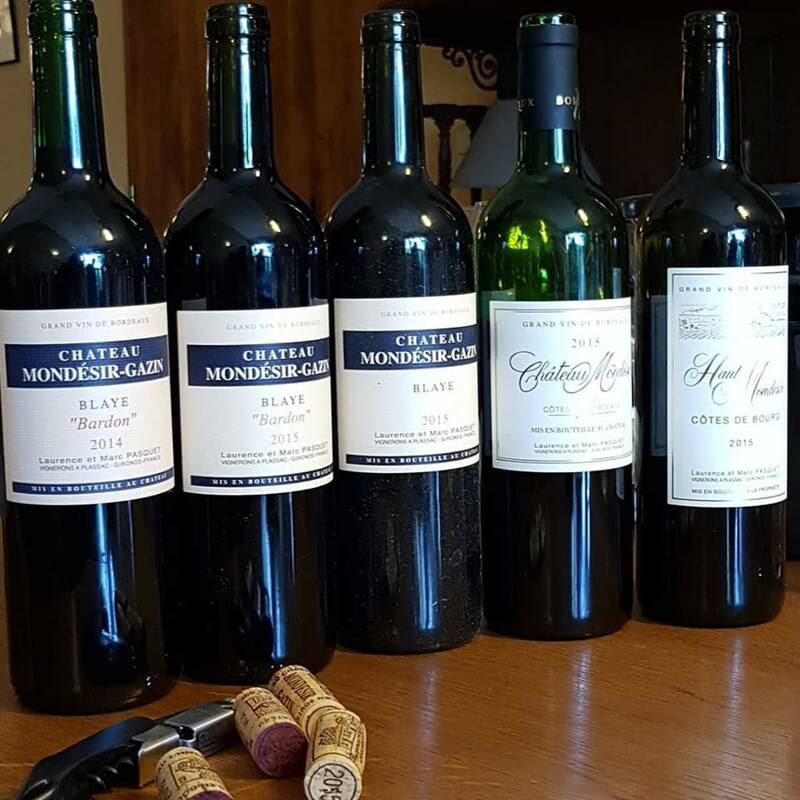 2015 Château Mondésir-Gazin Blaye Côtes de Bordeaux "Bardon"
Elite Wines: 100% Malbec. “Bardon” is the name of the plot from which this 100% Bordeaux Malbec is crafted. Aged in for 22 months in barrels (50% new), this is one of only two 100% Malbecs produced from Bordeaux! This wine has a deep purple color & profound nose of black fruits, spices, cedar, lead pencil, and spicy oak. These same aromatic notes carry over on the palate, in a full-bodied style, extremely round, juicy, & supple, with a tightly knit yet very ripe structure and concentration. 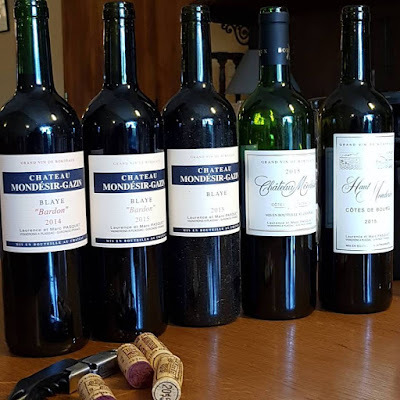 2014 Château Mondésir-Gazin Blaye Côtes de Bordeaux "Bardon"
Elite Wines: 100% Merlot. A deep ruby color, this full-bodied wine has loads of black fruit, spicy plum, vanilla, pine wood box and blackcurrant. On the palate, there is harmonious black fruit with notes of licorice, black currants, oak, and minerality. It has a supple finish with definite length in the mouth. Excellent with grilled steak. Elite Wines: 90% Merlot, 10% Malbec. 18-20 months in oak barrels. Thickly textured, deeply colored, & scented with dark ripe fruit, spices, oak, licorice. Wrapped in an incredible balance and harmony, full-bodied, full-flavored. Thanks Marc for a wonderful visit.